I will freely admit to never having seen a film by Fernando Arrabal prior to reviewing this DVD, although I certainly am aware of his influence on fellow surrealist filmmaker Alejandro Jorodowski, whose Fando and Lis was based on an Arrabal play. While I had heard comparisons of Arrabal's work to the likes of Jorodowski, Buñuel, and arguably Pasolini, nothing really prepared me for this work. Although billed as an allegory about abandoning religion and society (among other things), I Will Walk Like a Crazy Horse is a cryptic, enigmatic work that remains rather hard to follow and, at times, harder to watch. The film's central idea is that it's main character, Aden (George Shannon), is fleeing persecution for the murder of his mother. Whether or not he really killed her isn't an issue, but he flees into the desert for reasons unknown. Once there, he meets Marvel (Hachemi Marzouk), a midget who lives off the land and, in his simplicity, attains an almost spiritual aura because he's so uncorrupted by modern social values. While this is the setup, the film itself is anything but linear and totally focused on plot. Instead, it is heavily surreal and multi-layered, verging on madness. In some ways, it's also a complete mess. There's a jumble of strange images, the majority of which are very extreme. Virtually every taboo you could possibly imagine is broken, and the film veers into the 'mondo' realm at every turn. Words fail to truly convey just how extreme this movie can get, but let's just say the squeamish or easily offended should stay clear. I don't consider myself either of those things, but I still didn't see much point in the onslaught of shock. It also deserves mentioning that all of the most wild and far-out stuff in this film has almost nothing to do with its core theme; at least, none that I felt was necessary. While many consider Fernando Arrabal a genius, I wasn't particularly impressed. It's obvious that artistic passion was a part of this process and nothing feels thrown away or done in a hasty manner. I can respect that, but still don't see the point. 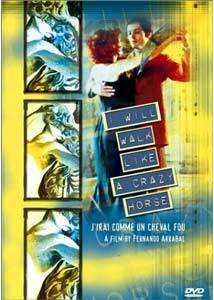 I Will Walk Like a Crazy Horse feels extremely pretentious. It lacked the kind of subtle artistry I typically prefer in a film that radically departs from the norm and just becomes really weird. The whole idea of this being a rejection of social values and such seems like an excuse to create non-linear imagery. Surrealism can be a striking filmmaking technique, and, offhand, movies like Eraserhead or anything by the Brothers Quay comes to mind, yet somehow they manage to embrace an ideal without completely throwing away any hope of making sense. Here, I just felt like I was being bombarded with whatever popped into the director's head. For some, this will be a wonderful experience, but for me, I found myself yearning for something more. Image Transfer Review: The transfer is warm and colorful, showcasing the wild imagery quite well. While there are age issues, mostly scratches and a few dropped frames, the whole presentation is obviously a respectful treatment of the source material, which is impressive here. There are no digital issues, which is surprising given the grainy nature of the print. Audio Transfer Review: The French audio is 2-channel mono and obviously does not represent any state-of-the-art surround experience, but does embody the mostly dialogue-filled soundtrack quite well. There is very little hiss, hum, or distortion of any kind. Extras Review: While I didn't particularly care for the film, the added features will certainly please the fan. While the lobby card gallery and original trailer are neat little views into the history of the project, there is almost an hour's worth of new interview footage with the director himself, as conducted by filmmaker/surrealist Nico B. This footage, thankfully, has its own chapter stops and English subtitles. Arrabal discusses various topics, but rarely stays long enough on any one subject. Much like the film itself, he wanders around on strange tangents and often does unusual things to distract from the interview (for example, one segment in which he holds a chair over his head while giving answers). The keepcase includes a booklet which discusses the film as well as some of the history of Arrabal's work and relationship to Alejandro Jorodowski. Arrabal, like many bizarre filmmakers, has been largely ignored in the home video market. While I thought ...Crazy Horse was a senseless jumble of nothing, it bodes well for the future of the European surrealists that this treatment on DVD is respectable, rather than a throwaway.